To maintain this competitive position, the Golden State’s transportation network cannot get bogged down. But, in some parts of the state, transportation already is. Add to this another of the Authority’s observations, and this is, that state population is estimated to reach 51.1 million people by 20605, 11.7 million more people than live in the Golden State right now or the equivalent of adding what is currently the entire population of Ohio in the span of about four decades6, this based, I’m assuming, on the present rate of state population growth. So, in order to stave off mobility meltdown, California must have a plan and fortunately, it does, a key component of which is high-speed rail. The United States does not have a true high-speed train system. Yes, it may be expensive to build, but what major infrastructure project isn’t? The current projections are that full build-out of Phase 1 (San Francisco-Los Angeles/Anaheim) slated to be completed in 2033, is estimated to cost $77 billion. A question: To meet envisioned or expected in-state travel demand, how many more roadway lane-miles and how many more airport gates and runways – not to mention added flights – will be needed and at what cost? High-speed rail provides an alternative. Take, for example, a car trip between Fresno and San Jose. In most instances, this takes three hours to complete the journey.8 With HSR and with trains running at speeds in excess of 200 miles per hour, the time to connect the two cities will be cut to a third or, an hour or less in travel time, in other words. Other benefits include a stimulus to local and regional economies – this is already being borne out with the construction aspect; a catalyst for promoting development around stations; and high travel impact, meaning the addition of high-speed-train travel will lessen the passenger load on the roadway and aviation networks. And, as with all infrastructure projects, jobs are created in corresponding construction work needed. But, unlike other transportation infrastructure projects, once construction is complete a number of permanent jobs will be required in the areas of operating, service and administration. As it stands, as this is being written, there are 20 active construction sites in the San Joaquin Valley and the work on such is being performed by some 2,000 workers. Slated to be operational four years from now – give or take, meanwhile, will be 200 miles of track in the San Joaquin Valley and the Bay Area’s Silicon Valley. The whole point of building high-speed rail in California – anywhere for that matter – is for the purpose of providing efficient, modern, fast, reliable, convenient, comfortable, safe and environmentally friendly transportation. No other mode can make such a boast or claim – none except for possibly another rail system of HSR capability which utilizes electricity to power its trains generated from 100 percent renewable energy sources, if such a system already exists. Is there one? Thereby insuring paying customers will never pay off the debt incurred by the state to build a worthless slow train. In light of the massive pension fund liabilities this state has, the “Browndoggle” will drive the state to the point of bankruptcy. It will also have no effect on the temperature or “climate change” as that is another gigantic fraud as evidenced the fact that the worldwide average temperature plunged by 0.56 degrees in the last year……….didn’t hear that on the news did you? I agree with everything you said except that the worldwide temperature plunged by .56 degrees last year. That’s wrong. We are experiencing climate change, but this boondoggle train is actually making it worse during the construction phase. 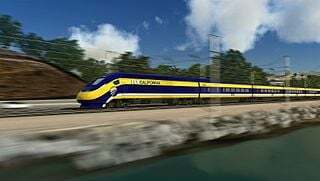 I’m sorry, but I need to know if you really believe that a bus ride from LA to Bakersfield, followed by a train running at maybe 60 mph to Sacramento and a transfer to the Capitol Corridor and then to Caltrain at San Jose to SF is going to be just as fast as a single train direct from LA to SF at up to 200 mph. I will admit that the $77 billion train could be replaced by more highways and airports at “only” $150 billion, plus the usual unexpected costs that plague all infrastructure projects; probably around $200-500 billion in more traffic jams and poor airline service. But I’ll also have to point out that if the global temperatures really were lower last year that’s not evidence of anything. Temperatures normally fluctuate from year to year, which is why scientists measure average temperatures over a decade or two. And there the averages have been increasing steadily. I trust peer reviewed science more than political diatribe. And the historical facts, both on climate and the success of the Acela, disagree with your politics. This article is baloney. From the California Legislative Analyst’s office: “High–Speed Rail Would Initially Increase GHG2 Emissions for Many Years. As mentioned above, in order to be a valid use of cap–and–trade revenues, programs will need to reduce GHG emissions. While the HSRA has not conducted an analysis to determine the impact that the high–speed rail system will have on GHG emissions in the state, an independent study found that—if the high–speed rail system met its ridership targets and renewable electricity commitments—construction and operation of the system would emit more GHG emissions than it would reduce for approximately the first 30 years. While high–speed rail could reduce GHG emissions in the very long run, given the previously mentioned legal constraints, the fact that it would initially be a net emitter of GHG emissions could raise legal risks.” Isn’t the massive development around stations going to use energy and contribute to carbon emissions? If ridership is low, which it will be, there are no carbon emission reductions. If they want to reduce carbon emissions at a fair cost, build more local transportation projects as it’s commuting that is contributing most carbon emissions, not long trips from SF to LA. I have not been off of the North American continent. So, I do not have any direct experience riding high-speed trains. However, I’ve ridden on Amtrak’s 457-mile-long Northeast Corridor between Washington, D.C. and New York City. Initially, this was under Pennsylvania Railroad control and later under Amtrak’s. From my recollection, the rides were always smooth. Top travel speeds ranged from (I would guess) 100-125 miles per hour. While not meeting the definition of true high-speed rail, that speed range surpasses any speed at which motor vehicles are allowed to travel. A plus in my book. Bringing this kind of service to California and to other parts of the United States is long overdue. Japan has enjoyed high-speed rail since Oct. 1, 1964 with not a single fatality reported attributed to a mishap. That’s a flawless track record. Japan’s Shinkansen bullet trains carry 151 million passengers per year. So, my question is: Why does high-speed rail work so well there and elsewhere, but the thinking or perception of many is that high-speed rail won’t work as well (or better) here? I really don’t get that part. Furthermore, the share of commuters on Amtrak’s Northeast Corridor “Acela’s” (rail versus air travel) is greater for rail compared to air between both Washington, D.C. and New York City and between the latter and Boston, MA. Travelers riding “Acela” trains are obviously finding value in this type of travel. It should be noted that the top speed for the “Acela’s” on 33.9 miles of Northeast Corridor track is 150 miles per hour. Average speed, meanwhile, as I understand it, is somewhere around 77 mph. This is still faster than permitted car-travel speeds. So, imagine if track was capable of handling higher speeds over a far greater distance. The presumption is “Acela” trains would garner even more ridership. Back to California, work is underway on the first 119 miles between Wasco/Shafter in Kern County and Madera in Madera County. Once finished and open for service in 2022 (the projected date of opening), with higher-speed train travel (top speed is currently 79 miles per hour on the Amtrak “San Joaquin’s”), on dedicated double track with no intersections (all vehicle and bicycle and foot traffic will be carried over or pass under the high-speed rail line, similar in principle to the way highways are built), and no with interference from opposing trains, riders will find tremendous value in those features. As for air quality improvement, this goes without saying. In the “High Speed Rail and Sustainability” report from the International Union of Railways, there is information pointing out the air-savings advantage of high-speed rail travel between Frankfurt and Hamburg in Germany. To be perfectly honest, I have a really tough time understanding why any opposition to high-speed rail at all. Arguing that building mass transit increases pollution is similar to absurd articles that planting trees, building solar power, and buying electric cars increase pollution. Come on. Even taking a seed from a tree, walking it over to a clear spot, planting it, and watering it a few times to get it started, would create pollution (the food you eat for your own physical energy to plant and water the seed, the chemical process to make the watering can, the plumbing/water facilities to get the water). Arguments against these kind of projects that it would hurt the environment are more than likely coming from the right who are trying to spin the truth. planting trees doesnt take millions of tons of concrete and boring through mountains. Wouldn’t the same be true of a highway built having equal capacity covering the same distance as what the high-speed rail line would create? Why does it seem that highways get a free pass? Even if in building the high-speed rail line it were to have greater negative air impact from carbon dioxide emissions – which I don’t believe it would – compared to that of a comparable highway, once polluting cars and trucks hit the pavement on the latter, there would be a substantial increase in emissions not only carbon dioxide, but oxides of nitrogen, hydrocarbon and particulate matter emissions, to name a few. Fully renewable energy supplied electricity for high-speed trains produce virtually zero emissions. That all said, I just don’t see how you could have arrived at the conclusion you did.